Reading the paper, an article catches my eye: A best-selling author has decided to turn all of his out-of-print books into e-books. The idea is dizzying, the ramifications stunning. Is it possible that dead books can be resurrected, their spirits shape-shifted by the technological forces of cyberspace? I dig up an old copy of my novel Maximilian's Garden. It was published 20 years ago but lost its acquiring editor and died an ignominious death. Twenty years ago there was no such thing as electronic-rights clauses in book contracts. I own them by default. On average, traditional print publishers pay a 10% royalty on the cover price of the first five thousand hardcover copies sold, 12% on the second 5,000 and 15% on sales above 15,000, less returns. For paperbacks, the royalty is even slimmer: 7% percent of the cover price, less returns. At those royalty rates, the average hardcover book earns the writer between $1.60 (discount price) and $2.50 (full price). Paperback royalties earn the writer, on average, one dollar for mass market, slightly more for trade paperbacks. On e-books, royalties are a bit higher. For every e-book priced under $9.99, Amazon (AMZN) Kindle and Barnes & Noble (BKS) Nook pay 70%. 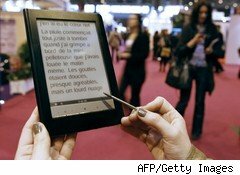 A five-cent fee is added to deliver the e-book to a reader. If I set the price of my e-books at $6.99, a middling price, my royalty on each book will be $4.90. Maximilian's Garden will have to be rewritten. Twenty years ago I didn't have the craft I have now. For that matter, I also don't like the title. I tear the book apart, rewrite it and rename it Children of Guerrero, after Gonzalo Guerrero, a Spanish seaman who was shipwrecked on the coast of Yucatan in 1511. His progeny, it is said, are Mexico's mestizos. I go to Amazon Kindle's help page, and start the transformation. My manuscript has to be converted into Microsoft Word, then I need to insert the proper e-book codes. For someone who is completely computer literate, this might not be all that difficult, but I need a little help. Luckily for me, there are companies that do e-book conversions, and when I call one, I discover that the price of a conversion to Amazon Kindle is $125 (depending on the number of pages), while conversion to an e-pub -- which can be uploaded onto various other e-books -- costs $195. I choose the e-pub conversion. A few weeks after I send the Word document of the book to the e-book conversion company, I receive the first draft of the conversion by email. I proofread it, and discover that it is full of glitches. The conversion process garbles some sentences, upends margins, interpolates unwanted foreign symbols and erases my scene changes. The document goes back and forth several more times. I proofread each time and send it back with a list of changes to be made and errors to be corrected. At the same time, I work on putting together a cover. Pam Newton, a friend in England who is an artist, produces an original water-color image of a caravelle off the coast of Yucatan. After the fourth pass, the book is done, title changed, chapter index and cover inserted. Children of Guerrero is finally ready to face the world! My next move is getting readers to buy my e-book. Best-selling authors carry their fans with them wherever they go; they don't need a print publisher to pave the way. As for me, I've had seven novels published by major publishers and sold one, Goodbye, Saigon, to 20th Century Fox. Still, I'm not a best-seller, and I need to figure out how to find readers for Children of Guerrero. I decide to use my social network connections to start the book on its way. I send a pithy little e-book pitch to my friends on Facebook. They love it, and I'm soon booked on podcasts and invited to guest blog. Will it be enough to make the book a success? I don't know. One thing I do know: E-books are here to stay, and the lofty position of publishers as literary gatekeepers is at an end. If publishers are to survive, they will have to abandon old models and adopt new ways of publishing books; in essence, they need to step out of the 19th century and into the 21st. Writers will come into their own, no longer chattel to a multinational industry, but newly minted entrepreneurs about to occupy bargaining positions they never could have imagined. A wave of ancillary publishing services -- freelance editors, cover artists, e-book reviewers -- will rise up. The heady perfume of revolution is in the air, and I am the author/publisher of an e-book that can't be orphaned, remaindered or killed. Nina Vida has had seven novels published by mainstream publishers, including her most recent, The Texicans. Her novel about Mexico, Children of Guerrero, is her first solo foray into the world of e-books. Read her blog on Red Room.